The Nanango Tourism and Development Association want to connect Nanango to the Brisbane Valley Rail Trail (BVRT). At the group’s most recent meeting last Thursday night, NaTDA president Barry Green told members when the Brisbane Valley railway was operating, cattlemen used a stock route to move cattle from Nanango to Yarraman so they could be railed to Brisbane. Now the railway no longer existed, the stock route had fallen into disuse. “While Nanango and Yarraman were never actually connected by rail, this trail was an important part of the transport network that was used for many decades,” Barry said. “It follows the proposed rail link between Yarraman and Nanango that was never built. Barry said he had canvassed the idea with Brisbane Valley Heritage Trails, who in turn had talked with the State Government authority responsible for stock routes. They were told stock routes are gazetted roads open to the public, so the idea was viable. Brisbane Valley Heritage Trails want to erect three signs on the stock route to guide travellers along the rail trail extension. Two signs – one pointing to Nanango, one to Yarraman – would be directional, and the third would be an interpretive sign explaining the history of the stock route. The group are now seeking a grant to fund the signs. 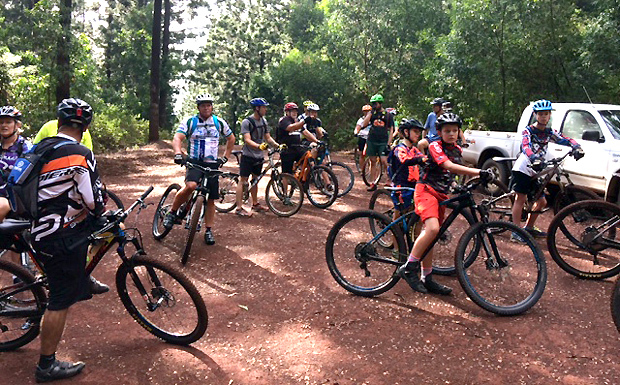 Last year the BVRT Users Association developed a cycling route from Yarraman to Kingaroy using forestry tracks and rural roads in an effort to encourage visitors to ride both the BVRT and South Burnett Rail Trail. Barry said he was grateful to that group for doing this, but the route was potentially dangerous because it used public roads and was probably unsuitable for horse riders. “The stock route is much safer, particularly for horse riders, and very little work would need to be done to bring it up to BVRT standards,” he said.